LOS ANGELES, Nov. 29, 2006 -- The Acura "Advanced Sedan Concept" made its world debut today at the 2006 Los Angeles Auto Show. Created by Acura's Los Angeles-based advanced design team, the concept features a modern, powerful exterior while retaining an ultra luxurious feel. "The Advanced Sedan Concept illustrates Acura's commitment to modern design and cutting-edge style," said John Mendel, senior vice president, auto operations. "With our advanced design team taking a significant role in shaping future vehicle design, we can expect upcoming products to reflect this progressive, forward-thinking styling." The concept's generous exterior proportions suggest that a large, powerful engine lurks beneath the surface. The exterior lines reveal a sheer, sculpted lower body contrasted with a taut, architectural cabin. 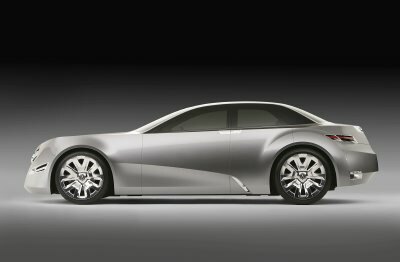 Although ultra-modern in its design, the concept retains the classic silhouette associated with a flagship sedan. Low to the ground, the concept is anchored by large 22 inch front and 23 inch rear tires which are mounted to custom billet-machined, polished aluminum wheels. Powerful brake discs and calipers accent the wheels and large ducts direct cooling air to the components. Bold wheel arches and flares add to the concept's muscular appearance. The sleek, compact cockpit nestles atop the sculpted body and flows from hood to trunk. For a unique panoramic view, the roof is constructed entirely of tinted glass that shades the occupants while still connecting them to the outside world. "We wanted to capture the essence of an ultra luxurious sedan but give it a striking, mysterious presence to create a vehicle with a dual personality," said Dave Marek, chief designer, Honda R&D Americas, Inc. "The concept echoes this quality with its clean exterior lines, a wide, stance, high performance cues and key luxury accents." The hood is accented with pronounced character lines that culminate in the aggressive five-sided grille, which contributes to the sedan's bold presence. The commanding grille is constructed of polished aluminum and features a cut crystal Acura emblem. The narrow headlights also double as air intakes and are positioned low on the bumper, further enhancing the sedan's already commanding 79.5 inch width. "The front of the sedan communicates power and luxury," explains Marek. "The pronounced hood and large grille communicate performance, while the jewel-like Acura emblem captures the essence of pure luxury." In the rear, the Advanced Sedan Concept has a flush mounted rear bumper with the high-mounted stop lamp integrated into the center break of the trunk. The jeweled taillights are pushed to the outer edge of the bumper to further enhance the vehicle's wide and low appearance, while integrated dual exhaust outlets complement the sedan's performance-oriented style. During the past decade, several Acura vehicles have been designed and developed in the U.S. including the award winning MDX luxury SUV, the innovative TL performance luxury sedan and the all-new RDX turbocharged crossover SUV. Acura will continue the expansion of its U.S. design capabilities with the addition of a dedicated Acura Design Center that will open next year in Torrance, CA.